The Multitracker provides the most powerful combination of a high power Net toner, cable and network testers in one unit. It generates 2 selectable net tones with the capability to quickly locate and identify active network cables connected at HUB, Switch or Router, and live phone line systems. It also features a pin-by-pin cable testing with an auto scan and step modes for checking detail VDV (voice, data and video) cables pin-out configuration. Network test includes detecting PoE, Ethernet and Telephone services. (A) PoE detection to identify RJ45 jack for PoE existence and type PSE either end-span or mid-span or ultra power over 4 pairs. PK-108 only it also tests the presence of PoE power either 802.3af (PoE) or 802.3at (PoE+) (2pair-30W, 4pair-60W) in your network; ensure adequate power for powered devices such as VOIP phone etc to avoid a PoE disaster. (B) HUB blink/Link mode, the toner send signal to make the connected PoE/Ethernet port flicker at a set frequency. For easy active network outlets and cables identification and locate corresponding port on HUB or Switch and link light to identify an active Ethernet port. This will enable the installers to easily and quickly find the connected port for an Ethernet cable. (C) Detects telephone POTS service, indicate polarity and active line number on voice circuits (PK-108A only). Other feature includes wire continuity testing, use with included F to alligator clips adaptor for checking bare wire such as speaker wire & security/alarm networks. 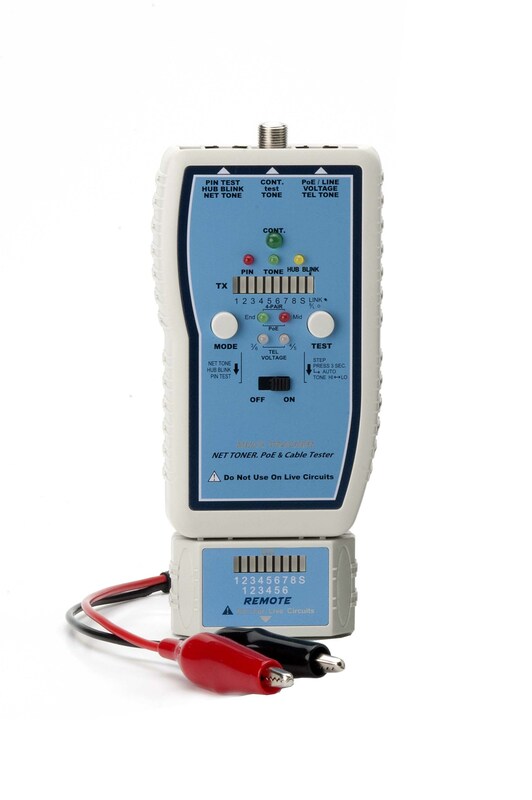 Both main unit and remote unit are with over-voltage protection up to 60 volts to protest and prevent tester damage from connecting live circuits, and with battery low indicator avoid affecting the test accuracy. 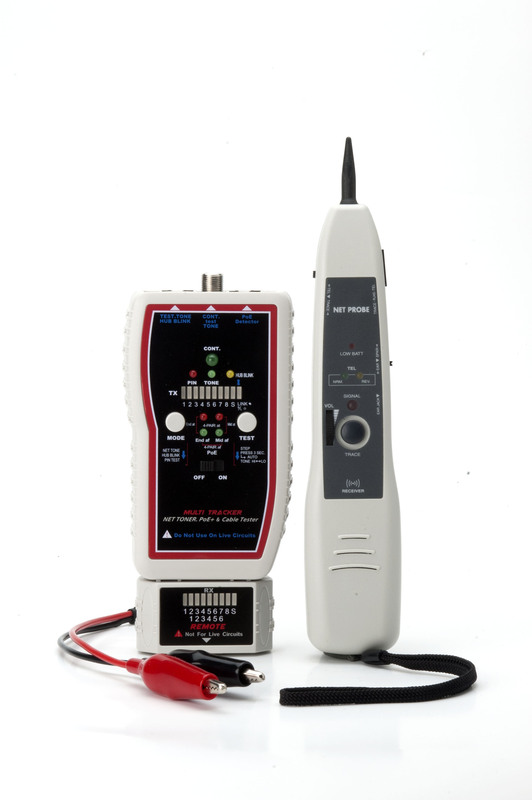 The MultiTracker sends a tone down the cable being traced for use with the Net Probe detects the tone in order to locate and identify the target cable. It powerful feature makes testing and tracing more efficient, this save time and cost. Net Toner Pro Kit is an ideal tool for installation, service and repair, especially used by cableing installers, Datacom Technician, IT professional and network administrator for locating cables more effectively at termination blocks, patch penal, active network cable at Switch, live phone line, single conductors cables within a bundle, at a cross-connect point or at a remote ends, find the cables others can’t. 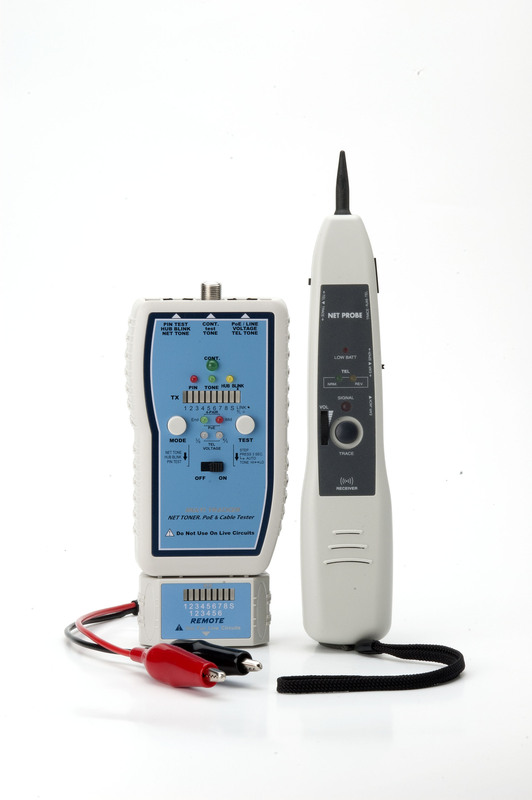 Combines the powerful Net Toner, cable tester and network tester in one unit. Generates high power Net Tones for tracing and locating active cables & primarily used on data cables and on active networks as well as live phone line systems. 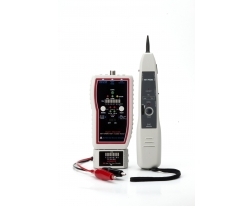 Provides clear pin-by-pin wire mapping with Auto scan and Step modes with voltage protection. Network testing includes PoE detection, HUB blink/Link light, and detects telephone POTS service. PoE detection to detect if RJ45 outlet for PoE existence and type PSE either end-span or mid-span (PK-108/108A). Also tests the presence of PoE power either 802.3af (PoE) or 802.3at (PoE+) in your network (PK-108 only). Detects telephone POTS service indicates polarity and active line either Line 1 or Line 2 (PK-108A only). Quickly & easily locates active network outlet corresponding port on HUB, Switch or Router. Link light to identify whether a network outlet is an active Ethernet port. Continuity function allows determine if there is DC continuity between two un-powered wires. Provides F to alligator clips for toning punch down blocks or non-terminated cables. Net Probe comes with adjustable volume, earphone jack, RJ45 jack and replaceable tip with signal strength and low battery indictor. PR-06PL with flash LED light. Network, CATV, Audio/Video, Security and Telephone Systems. Cable Testing, Tone Tracing, HUB Blink, PoE detection, detects POTS, service continuity testing.